At the convention center in Fort Wayne, Indiana, the entire Winter Fantasy convention fits into one hall. Despite the event’s compact size, it delivers as much Dungeons & Dragons as the biggest table-top gaming cons. Imagine the D&D track from Origins or Gen Con, complete with the Adventurers League brain trust, and the game’s most passionate players, concentrated in a convention of its own. Plus, the con offers plenty of inexpensive hotel rooms. Sure, Fort Wayne suffers an icy February, but you come to game. 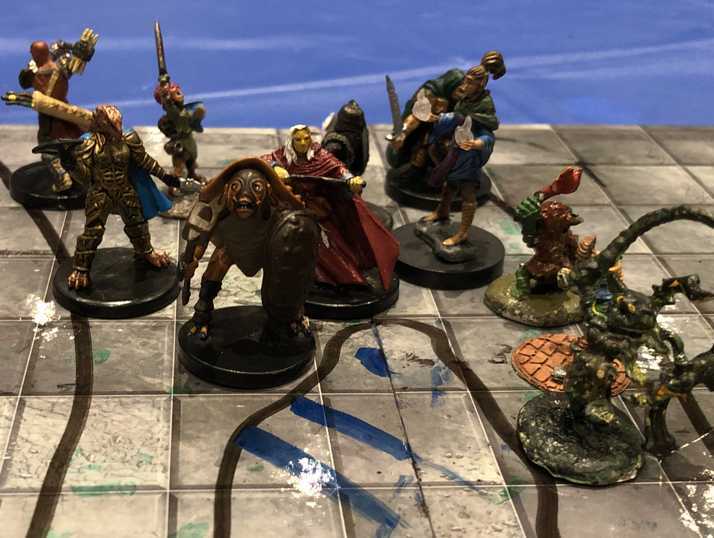 This year’s convention inspired 8 thoughts about D&D. 1. Winter Fantasy 2019 marks my first convention under the Season 8 Adventurers League rules, which meant lots of jokes about the system’s abstractions. Based on descriptions at my tables, treasure chests now contain vouchers allowing the purchase of magic items, coins disappear into trusts payable upon leveling, and hardened mercenaries now tackle deadly missions for the promise of gratitude. (These adventurers took Intelligence as a dump stat and think “gratitude” is a gemstone.) For a summary of the season 8 league rules, see My Dungeons & Dragons Adventurers League Quick Reference Sheet. Despite all the jokes, players seemed fine with the practice of unlocking magic items. Other aspects deserve changes. I plan a deeper look in a future post. 2. The convention’s organizer, Baldman Games, creates Adventurers League scenarios set in the Moonshae islands. With Shawn Merwin and Eric Menge shepherding the writing, these adventures boast an otherworldly flavor of Celtic myth and faerie. In Moonshae, the good fey are dangerous, the bad fey are creepy and dangerous, and the story ends when the witch eats the children. Those brats had it coming. 3. My first game gathered James Introcaso, Mike Shea, Teos Abadia, and other D&D enthusiasts to play MOON4-1 Precious Cargo by Cindy Moore. Through our adventures, we befriended goblins, a svirfneblin, and a dog, adding all to our party. Credit our dungeon master, Garrett Crowe, for silly goblin voices and a knack for playing along. Just when Garrett seemed like a pushover, the svirfneblin betrayed us. Good move. Whenever I run a D&D game for kids, their party seems to gather an entourage of pets, companions, and friends. The kids love it. So what does it say when a party of “mature,” “sophisticated” D&D players gathers a similar zoo? Don’t answer that question. And if my editor puts quotes around any words, ignore them. 4. Speaking of strategic mastery, our party started befriending monsters because Cindy penned a challenging adventure that made combat seem risky. I love difficult adventures because they can either bring tense battles that push characters to their limits or—in our case—alliances with one-armed goblins who fancy themselves emperor. Because Cindy’s adventures once carried a reputation for being cupcakes, this scenario’s difficulty surprised me. Later in the con, I asked her if this reputation led to a change in style. “Yes, I said eff you all.” Well played, Cindy. 5. As for challenges, a highlight of my games came when a kraken tentacle hurled my unconscious character to another game table. The incident came during the D&D multi-table special adventure MOON ES-1 A Drop in the Ocean. The DMs invented a process where tentacle attacks could fling characters from table to table. Falling characters landed in the quipper-infested waters controlled by another DM. Players loved it. Many multi-table adventures feature a way for characters to jump between tables, but they typically move in response to a call for help. Players never ask for help, so nobody moves. The tentacle rule sparked concerns that too many people might temporarily land at a single table, leading to a party size that exceeded league regulations. Luckily, someone read the part of league guidelines that grants DMs authority to make rulings that make things fun. Dave and Gary did not give D&D to us just to see a game where kraken tentacles can’t hurl unconscious characters from table to table. 6. Another highlight came when I played Invasion from the Planet of Tarrasques run by the adventure’s author, James Introcaso. This stands as my first game with top-level characters. Despite our superhero-like power, James pressed us to our limits and we had a blast. This adventure serves “over-the-top, gonzo action” without becoming silly. I’ve already committed to running it for friends. 7. The play of the convention came during the adventure MOON6-2 Troubled Visions, run by Eric Menge. The adventure pits the party against a fey prince named Uznezzir, who revels in everything repulsive and unclean. Our party found the prince’s captive and unrequited love, an Eladrin woman named Aodh. Uznezzir offered her freedom as the stake in a challenge. He suggested a riddle contest. D&D players know how that goes: The players try to solve a riddle and the adventure moves on a well-trod path. Instead, a party member played by Jason Pearson challenged Uznezzir to a compliment contest. Is that even a thing? Whoever lavished Aodh with the best compliment would win her freedom or her eternal imprisonment. She swore on her honor to judge fairly. While the party struggled to craft praise, Eric as Uznezzir found quick inspiration. At last the party finished and we read our work. “Aodh, Your hair shines like the sun yadda yadda yadda.” Surely Uznezzir’s honeyed words would best our platitudes. We won the contest. In the tradition of fables, Jason had realized the fey prince’s weakness and used it to outsmart him, while Eric had been quick enough to see the twist in the story and play it out. This may rank as the best moment of collaborative storytelling I’ve seen in a D&D game. 8. The authors of D&D’s creature statistics missed an opportunity when they failed to give owls an 18 Wisdom. This entry was posted in Conventions and tagged Adventurers League, Baldman Games, Cindy Moore, Eric Menge, James Introcaso, Mike Shea, Shawn Merwin, Teos Abadia, Winter Fantasy. Bookmark the permalink.